Australian Bird Feathers : Barkart!, Natural art with bite! 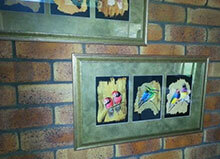 A selection of Australia Native Bird Feathers. All feathers are supplied under licence and legally obtained. Permit will be supplied with each purchase and species. We are selling off the stocks of our feathers that are not used in our art pieces. Remember, to own an Australian Native Bird Feathers especially Raptor feathers is very special, these are highly restricted by the Australian Government.